Browsers have witnessed significant changes in recent times. Whether it’s a boost in speed or some added functionality, browser developers are pulling out all the stops to come up with the most superior product. Opera developers also came out with their bid – Unite, a technology that they claim will turn a computer running the Opera browser into a web server. Contrary to the traditional client-server approach, Opera claims to place the user in control of his / her own data, by allowing users to connect directly to their friends for sharing files and also allowing several other activities such as networking and more. But who really wants so much control? More importantly, does anyone care? People are very comfortable having hundreds of photos hosted on third party servers. Most average users won’t even understand the difference between sharing content from hosted services and their own hard drive. If Opera wants to succeed with Unite, it’ll have to move past flogging this concept and playing on users inherent fears about privacy and control. Besides, many online bloggers have pointed out that given the centralized routing of data, you eventually do end up relying on Opera proxy servers, making this an indirect approach after all. We seriously doubt all the hype that Unite will reinvent the web. Services such as Windows Live Sync and Dropbox have been allowing file-sharing and similar services for a long time, albeit without browser integration. 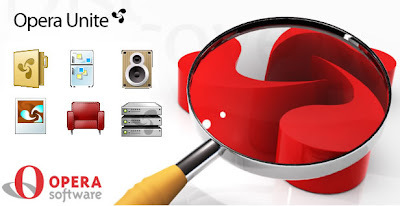 In fact, many of the little services offered by Opera Unite are already being offered by different players independently. All Opera is doing is consolidating all of them under its browser’s umbrella – hardly ground breaking. These services include file sharing, photo sharing, note sharing, remote media player, a chat room service and a web server. The first two are too familiar. The Fridge is a service that seems fun at first, but makes you wonder if it is really useful. Opera describes it as “A fun place for people to leave notes on your computer.” It is the virtual equivalent of leaving notes on the refrigerator door. Except on your virtual fridge, it’s not only you but a whole lot of your contacts online that can leave you notes. All they have to know is the unique URL that gets created, which goes something like http://compname.username.operaunite.com/fridge/. The Media Player service allows you to access your complete home music library from wherever you are, without having to upload it. The web server allows you to host web sites off your PC. To try out Unite, head over to the Opera web site and download the latest alpha build. In the left panel, you will find the Unite button which gives you access to these services. You will need to register an account with Opera, if you don’t already have one. Opera is also offering the API to developers to create their own Unite services. So far, there are no new services added to the Unite repertoire. The bottom line is that Opera makes one of the most stable, fast and light browsers in the market. They should probably focus on that core strength instead of tangential experiments. Yes, we know it released at the beginning of June but it’s never too late to take a crack at something that claims to be the “World’s fastest browser”. Also, the recent update (4.0.2) to the browser’s Java engine released mid-July, is supposed to make it stable, and so, worthy of being pitted against fellow contenders in the browser world. Whether it lives up to Apple’s ambitious claim, we shall see later; for now let’s look at the user experience that the browser provides and the improvements it offers over the previous release. Even with a cursory glance, you’ll see the similarity with Chrome. In particular, the page control and settings buttons at the top right corner of the screen. The drop down menus that they produce are almost identical. So is the position of the forward / back navigation button as well as the refresh button. The only difference in the navigation bar is that the search field is independent of the Address Bar, while in Chrome they’re clubbed into one. The visual effects are spectacular, as with any Apple product. 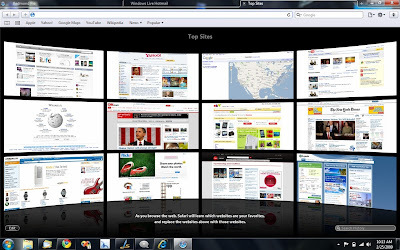 The home screen which shows the most visited sites or favorites, looks stunning. It’s a change from the older concept of having the most recently visited sites. But navigating from here seems sluggish when compared to Opera or Firefox (when running on a Windows 7 system). The start page is fully customizable, in terms of sites you want displayed, size of the panes and arrangement on screen. Going into the edit option will bring up a pinning tack icon that makes the site a permanent one, while the X will get rid of it. Also, it appears Apple’s affinity for coverflow continues. The feature has now been ported into Safari to let users browse through history using the coverflow style. So web pages in your browser history will be smoothly gliding past at your will. Speaking of history, if you don’t want to leave a digital trail behind, there’s the option of using Private Browsing akin to Chrome’s Incognito mode. The improvements however are not all visual dazzle. There are improvements under the hood and even in terms of usability. An example of a usability tweak is the ability to grab tabs into new windows; again this one comes from Chrome. The Java script engine Nitro, has gone through a revamp with this version contributing greatly to its speed and stability. Now for the speed. Since Safari is so similar to Chrome (uses the same rendering engine) we decided to pit it against only that browser for the speed comparison. Besides, Chrome is also regarded as the strongest contender to the title of “fastest browser around” so we figure it should be an interesting bout. For some quick results we put both browsers through a benchmark and a real world page loading test. The browser benchmark tool from future mark is quite popular. It is a six step test process that takes the browser through the grind of loading, sorting and searching for data and even measures your browser’s ability to render and modify specific HTML elements used in typical web pages, amongst other things. On a P4 system running Windows 7 Safari 4 secured 1,999 Points, while chrome got 1,748. Interestingly, the overall scores accumulated on the web site also showed Safari to be the fastest browser. The scores were from PCs based on the most popular processors around (i7 920, Core 2 Duo E8400, and Phenom II X4 940). Another interesting point to be noted in terms of rendering benchmarks is that Chrome scores 99 (with a linktest fail) on an Acid 3 test while Safari gets a complete 100. This makes it only the second browser yet to hit the mark. As for the page loading test we decided to note the time taken to load a single tab of techquark.com. To time it we used the XNote stopwatch application which was started simultaneously with a mouse click corresponding to hitting the enter key for the address bar of the browser. The results were quite inconclusive as both browsers did a mighty fine job of rendering the page quickly. As for start up time however, Chrome was much faster on our system. What about memory usage? Some memory usage charts online showed Safari 4 to be significantly low on resource consumption, coming in very close to Opera. When we checked our process manager with three tabs open pointing to techquark for both Safari and Chrome, we found Chrome to be lighter. Oh well, the complaint for bloatware is always there, but as long as the application is fast and does what it’s supposed to, we’re not too bothered. Indian web startups back again? Since the dot com bust of yesteryears, several interesting concepts remained just that – interesting concepts. For a while now webpreneurs have been venture shy, but things have probably started looking up. This month, we came across two new startups that seem quite interesting and worth checking out. TweetKnot is a Bangalore-based web startup that offers a simple way of creating groups or communities on Twitter. The groups are called Knots. Every member of Knot can send messages to all other members. There are options to make private knots and even select the members whose updates will appear in a knot. To use the service you will have to give TweetKnot access to your Twitter account. TweetKnot seems somewhat similar to another service we had come across called Twibe. Yet, unlike Twibe’s clunky appearance, TweetKnot’s interface seems like a natural extension of Twitter. You can post updates to groups from tweetknot.com or even from your Twitter account using the syntax [D TweetKnot ]. Now, although it’s a fun utility, what comes to mind is whether the creators have any revenue model in mind, since that is a question even Twitter itself is still struggling with. The other startup, Zimblee.com, isn’t confused in that area at all. Zimblee is a tool that allows you to create online ad campaigns and schedule them to appear on different social networking web sites such as BigAdda. Apparently, it’s the world’s first custom online ad creator platform that is meant for use by advertisers, including individuals and small businesses. The tool is intended to be a do-it-yourself ad maker. The service itself seems pretty easy to use. The online demo gives a complete walk through of how advertisers can create their display ads, literally within a few clicks. And all this doesn’t cost the earth. They have packages that start from as low as Rs. 12,000.